After wowing us all with the HTC One, HTC has done some more number crunching and come up with a new numeral-namesake, the Desire 300. As we all know (well, everyone except Kanye West), the number 300 is synonymous with the Battle of Thermopylae, where a small Spartan (note: not Roman) army took out a Greek army of thousands. And this is precisely what HTC is hoping to do with this handset - knock the big guys out with what is a pretty simple, no frills device. The 4.3-inch handset comes with a dual core 1GHz Snapdragon processor and, well, it will also offer Blinkfeed as well, so you can keep up with all your social networks in one place. And it will be packing Android slathered in HTC Sense. 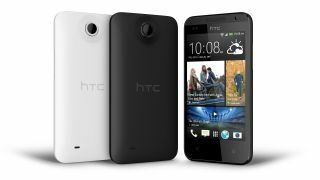 The HTC Desire 300 weighs in at just 120g and measures 131.78 x 66.23 x 10.12mm in size. It has 4GB of on-board storage, as well as a microSD slot for those who like to expand. There's also a 5MP camera with autofocus, a VGA front camera and video recording. So, more sparse than Spartan but it is aimed directly at the entry level crowd. The HTC Desire 300 will be available in select markets from October 2013. Looking for a new budget phone? Then check out our cheap smartphone guide.